The length and width of the neck warmer can be easily adjusted by increasing the length of the foundation chain to desired width and by adding more rows to the desired length. Pattern is written using US crochet terminology. 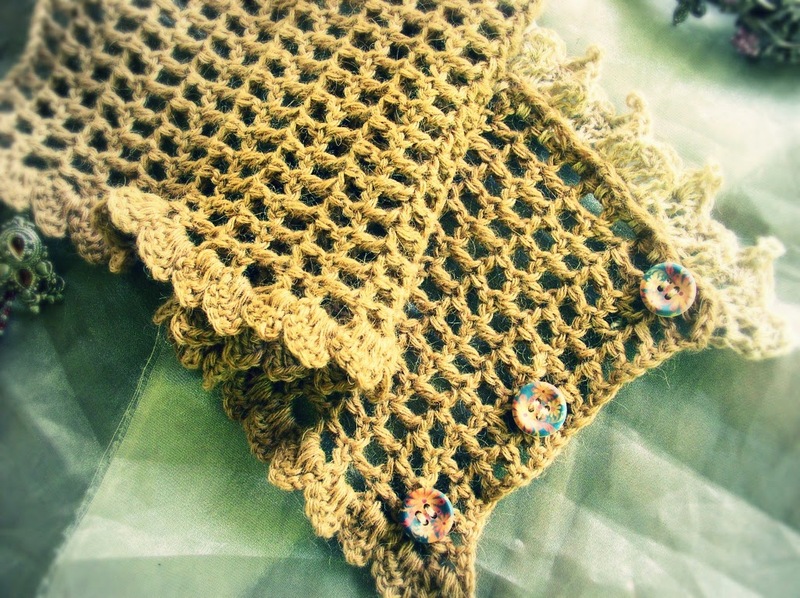 The neck warmer is started at one end using Baby Camel Yarn and larger hook, working vertically in rows until you reach the desired length. 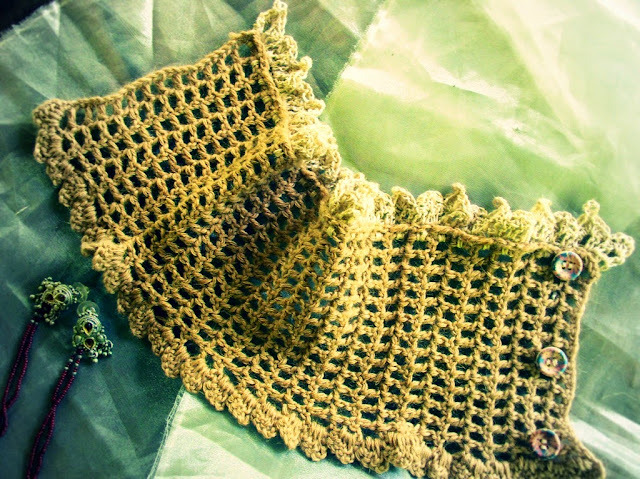 The neck warmer is a simple mesh of double crochet stitches separated by a single chain space. 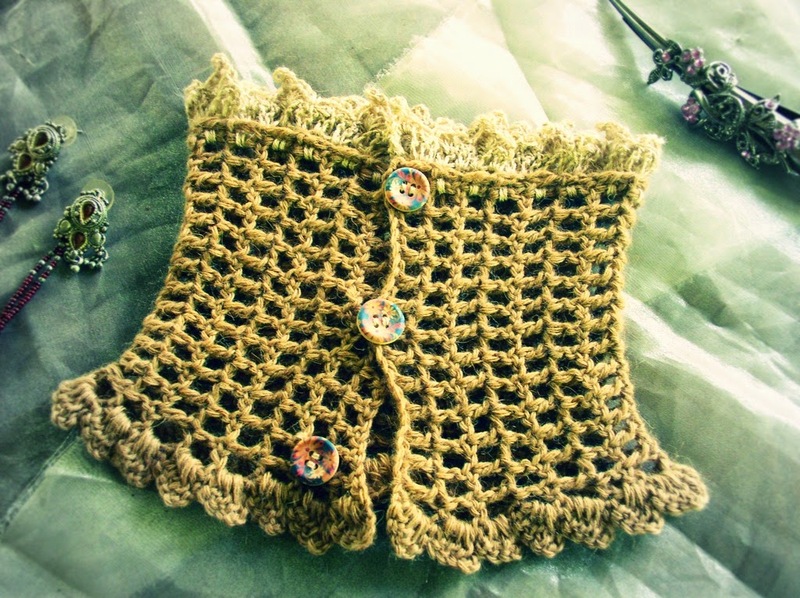 The upper edge of the neck warmer has rows of 2 double crochet stitches next to each other while the lower edge of the neck warmer has the double crochet and chain space. 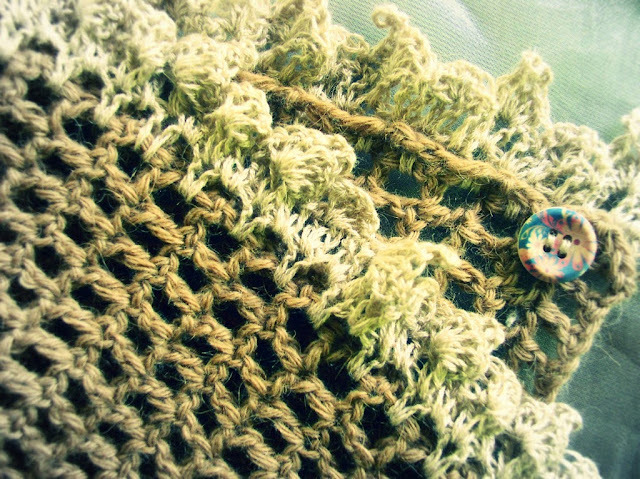 So you must end the row on the side where you can continue working along the lower edge of the piece. 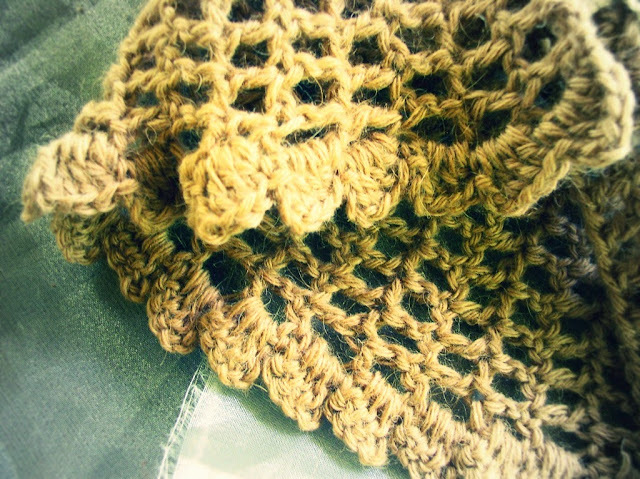 Here, a scallop edge is worked all along the lower edge of the neck warmer. The lacy edging is worked in Silky Camel Lace Yarn in two strands held together using smaller hook. The lace edging is done in 3 rows, started by joining the yarn with sc around the stem of the second double crochet along the upper edge of the neck warmer, right side facing. With Baby Camel 4 and 3.5mm hook, ch 31. Row 1: Dc in 6th ch from hook, *ch 1, sk next ch, dc in next ch, rep fr * all across, up to the second to the last ch. Dc in last ch. Ch 3, turn. Row 2: Sk first dc, dc in next dc, *sk next ch, ch 1, dc in next dc, rep fr * all across. Ch 4, turn. the second to the last dc, dc in last dc. Ch 3, turn. Rows 4-30: Rep rows 2-3, ending with row 2. At last rep, make ch 3 instead of ch 4. Do not turn. 3 dc in first sp, *sc in top of next dc, ch 3, 3 dc in next sp, rep fr * all along the edge of the neck warmer, up to the last sp. End with sc in top of last dc. Fasten off. Row 1: Ch 4, dc around same dc stem, *ch 1, around next dc stem make (dc, ch 1, dc), rep fr * all along the edge, up to the last dc stem. Ch 4, turn. Row 2: In first ch sp make (dc, ch 1, dc), *ch 1, in next ch sp make (dc, ch 1, dc), rep fr * all across to the last ch sp. Ch 1, turn. Row 3: Sk first sp, *in next sp make (dc, ch 1, dc, ch 1, dc), ch 1, sk next sp, sc in next sp, sk next sp, in next sp make (3 dc, ch 6, sl st in 6th ch fr hook, 3 dc), sk next sp, sc in next sp, sk next sp, rep fr * all across. Sc in last sp. Fasten off. Block to shape. 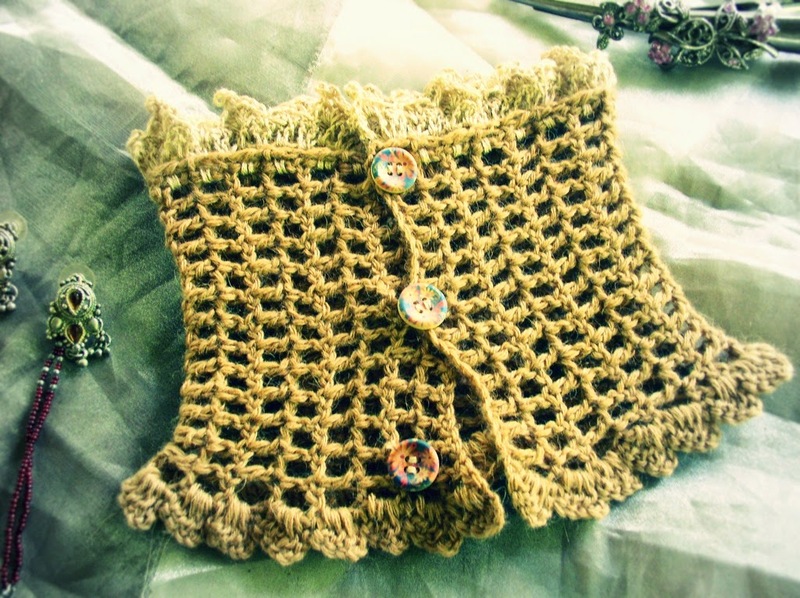 Sew the three buttons onto one end of the neck warmer as in photographs.